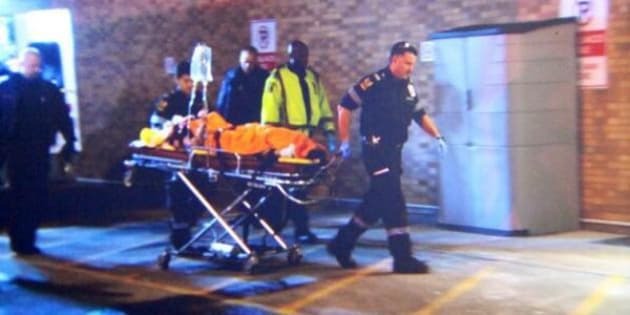 TORONTO - Police are asking for the public's help in tracking down a man suspected in a shooting that injured two women at Toronto's York University. The incident took place at the university's student centre late Thursday night. Police say a man in his mid 20s was going through the centre's food court around 10:45 p.m. when he "discharged" a firearm. One woman was shot in the leg and was taken to hospital with serious but non-life threatening injuries. A second woman was injured by shrapnel, taken to hospital for treatment and has been released. Police say they don't believe the women were targeted. The suspect fled on foot and it is not known if he is a York University student. Police describe him as a black man, about six feet in height, who was wearing a black hooded sweatshirt. Police now plan on reviewing video surveillance footage and interviewing people who were in and around the food court Thursday night. "The investigation is ongoing and we are speaking to witnesses," said Const. Victor Kwong. "We are also asking anyone had who fled the scene to please give us a call because they might have little bits and pieces that we aren't aware of." The shooting prompted a campus lock down which was lifted at about 1 a.m.
By Friday morning, York University said it had resumed normal operations. "The university has taken several measures to enhance safety on campus, including increasing security patrols and the use of Toronto Police Service," university president Mamdouh Shoukri said in a statement. "Our immediate focus is on supporting the two students and their families, and in providing counselling support for York Community members." Shoukri added that university representatives had visited both shooting victims in hospital and reported that the women were receiving the treatment they need.